The rare great black hawk rescued from Deering Oaks Park in Portland after suffering frostbite during the recent winter storm is in serious condition as its lower legs show signs of frostbite, according to officials from Avian Haven in Freedom. The great black hawk rescued in Portland’s Deering Oaks Park during a snowstorm last week is now in serious condition. Avian Haven, a wild bird rehabilitation center in Freedom, on Monday said the raptor has shown “significant deterioration” over the weekend as the effects of frostbite showed on its lower legs. 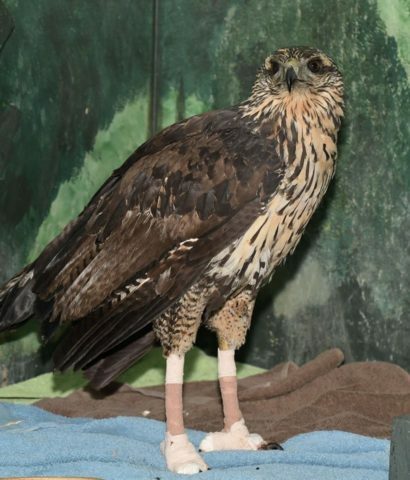 That comes days after Avian Haven said the hawk would likely lose a toe after suffering frostbite on its feet. “The condition is currently very serious, and we may not have seen the worst of it yet, but some hope remains,” Avian Haven said in a post on its Facebook page. Native to Central and South America, the great black hawk is the first of its kind to be spotted in the United States, Doug Hitchcox, an Audubon staff naturalist, told the BDN in November. Its appearance in Portland late last year made it a minor celebrity as birders flocked to Deering Oaks to catch a glimpse of the rare bird. Great black hawks do not usually fly north beyond Mexico, and it’s unclear what brought this particular bird so far beyond its normal range. But the tropical bird ran into trouble last Sunday when a major storm brought freezing temperatures, snow and sleet to the state. What comes next for the raptor isn’t clear. Mark Latti, a spokesman for the Maine Department of Inland Fisheries & Wildlife, told the BDN last week that officials are assessing the bird’s condition before deciding on a course of action. 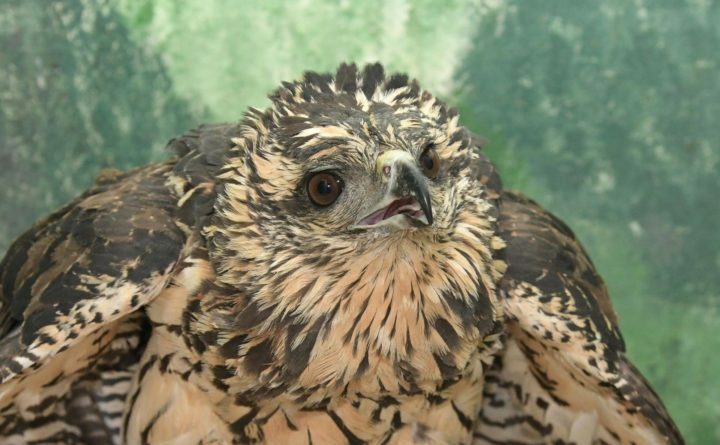 The Deering Oaks hawk continues to undergo treatment at Avian Haven. The extent of the damage to the raptor’s feet and legs may not be known for a few days. Still, the bird is able to stand upright and continues to display an appetite, according to Avian Haven. “As all of you know, this hawk is a trooper,” Avian Haven said.